Before the public having their hand on the App Watch, Yelp released their official app specifically designed for the smartwatch. The Yelp app allows Apple Watch users to find reviews, address, phones and general information including photos about millions of businesses around the world. You know what’s even better than having Yelp in your pocket? Having it on your wrist! 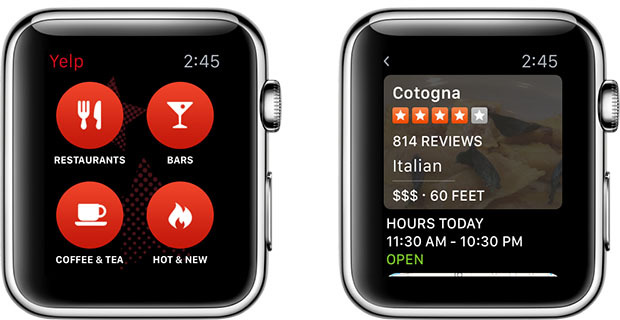 That’s right, with this update we’re introducing Yelp for the Apple Watch! • Find the best nearby restaurants, bars, coffee & tea, and other hot and new businesses. • Look up addresses, directions, today’s hours, and read authentic reviews written by a community of local experts. • Using the power of Handoff, you can easily jump from your watch to your iPhone to place a phone call, add a review, take a photo or video, or check in to the business. You can download the Yelp app for your Apple Watch from iTunes for free.